With some of the hottest days of summer still ahead of us, child safety advocates are focusing on a recent rising cause of children’s deaths. Leaving a child in a vehicle on a hot summer day has resulted in 17 deaths in 2014 in the US alone. It’s called hyperthermia or heatstroke, and it can happen faster than you ever imagined. Children or animals left inside a vehicle quickly overheat, resulting in devastating injury, permanent brain damage or death. • It takes 10 minutes for the temperature in a car to go up 20 degrees Fahrenheit, a high level of humidity can reduce the time by one half. • Cracking a window open and/or parking in the shade are not sufficient safeguards this may save your upholstery but it won’t help your child. • A child’s body temperature can rise up five times faster than an adult. A child dies with a core body temperature of 107 degree. • The temperature in a closed vehicle rises faster due to the air trapped in a vehicle warming. • Make it a habit to always check the back seat before you leave your car. • Place your purse, brief case, phone, lunch box or even your left shoe on the back seat with your child as a reminder to check the back seat. • If your child attends a Preschool or Home Center, have your school or caregiver call you if your child is not in attendance by their usual time. • Use a drive-through when possible. • Do not let your children play near locked or unlocked vehicles or play with your keys as they may accidentally lock themselves in the vehicle. 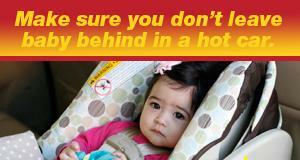 If you see a child left in a vehicle, immediately dial 911.